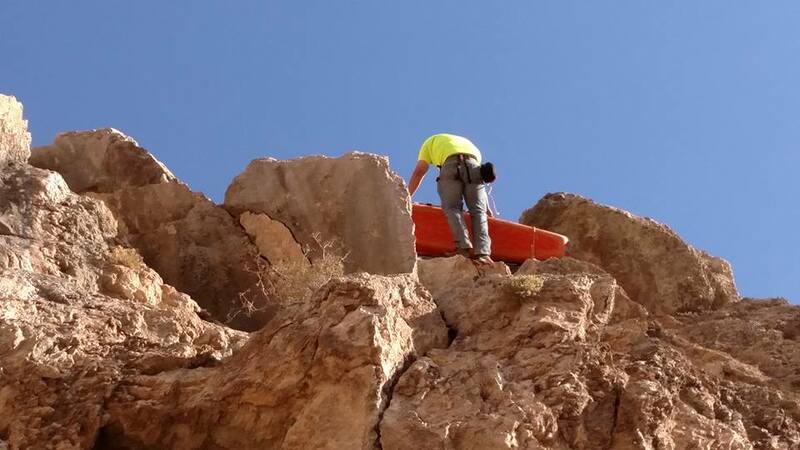 ST. GEORGE — The Sheriff’s deputy called a joint effort of agencies and a good samaritan couple “the perfect rescue” Saturday, one in which everyone came to the aid of a woman who had fallen while rock climbing in a location that was hard to find and hard to get to. It was the kind of injury that had risks involved and the rescue was time-sensitive. The woman and her husband were rock climbing at Welcome Springs in the Beaver Dam Wash National Conservation Area in the southwestern corner of Washington County not far from the Arizona state line. The woman was on her ascent and had hooked into the second bolt from the bottom – bolts preset in the rocks. As she climbed, she missed the third bolt up causing her to fall the 15-foot distance between the two back to the second bolt. The woman’s husband was able to lower her down from where she was hanging, Cashin said, a distance of about 30 feet to the base of the climbing wall. He set her down, made sure she had water and then went to find help. 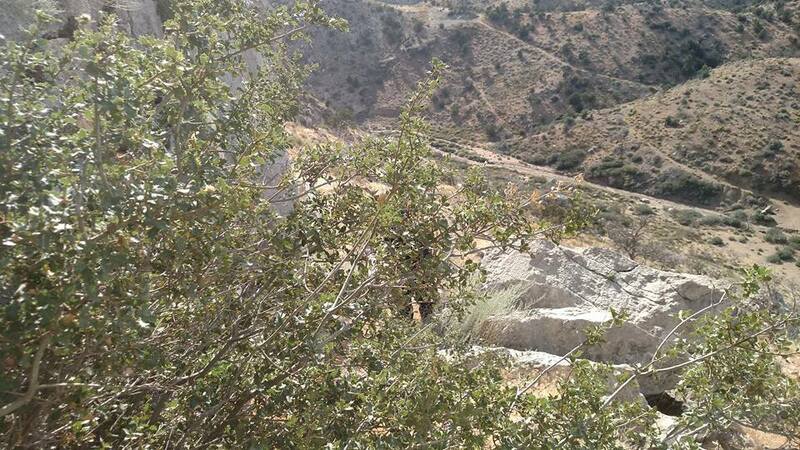 The husband ran down a 600-foot scree slope – one covered with loose stones and boulders – to his truck on Lytle Ranch Road heading to Old Highway 91 where he would travel south to get help. But both back tires on his truck blew out and he was stranded. About that time, an older couple in the area saw him and offered help. They drove him to Beaver Dam in Arizona where he called 911. The call, initially directed to Mesquite responders in nearby Nevada, was ultimately dispatched through St. George Communications Center about 2 p.m.
Responders had no GPS coordinates to work from and the area did not have cell or radio service. So the woman’s husband waited at the intersection of Lytle Ranch Road and Highway 91 to meet up with responders. Washington County Search and Rescue volunteer Mike Thomas was the first to arrive, Cashin said. The husband took Thomas directly to his wife – about 2 miles west and 2 miles north from the intersection. Thomas began emergency medical treatment until paramedics could arrive. Meanwhile, the couple who had helped the man get to Beaver Dam stayed at the intersection and offered direction to additional responders as they arrived. “That just may be the best part of the story,” he said. 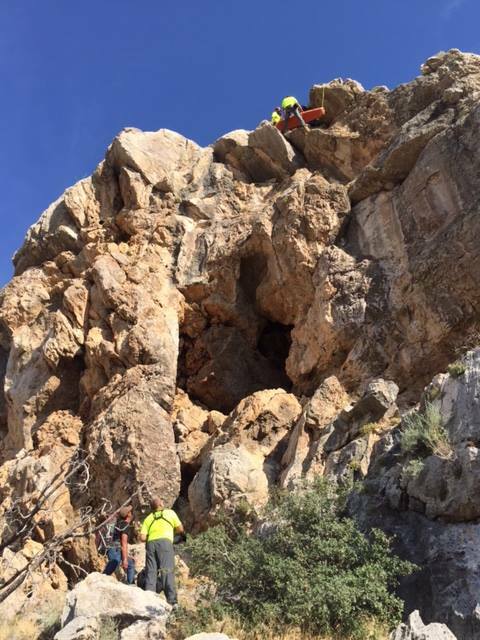 After rescuers hiked in, they had to choose between carrying the injured woman out on foot down 600 feet of scree and raising her up to the top of the rock where she could be picked up by helicopter. 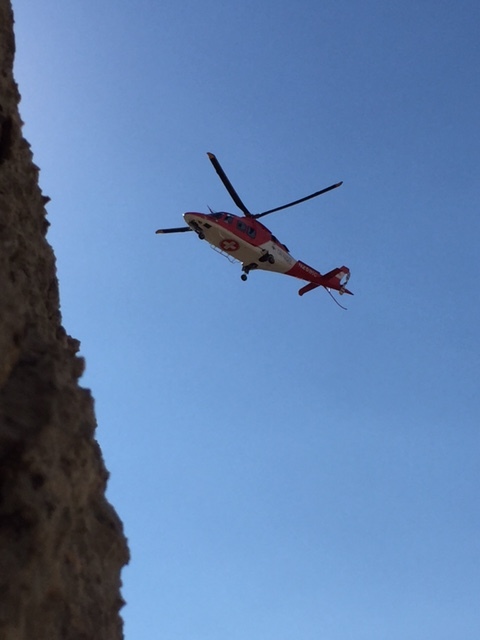 The woman had lain at the base of the rock cliff with extensive injuries to her leg for nearly three hours. Time was of the essence so Intermountain Life Flight was called upon to assist in the rescue. 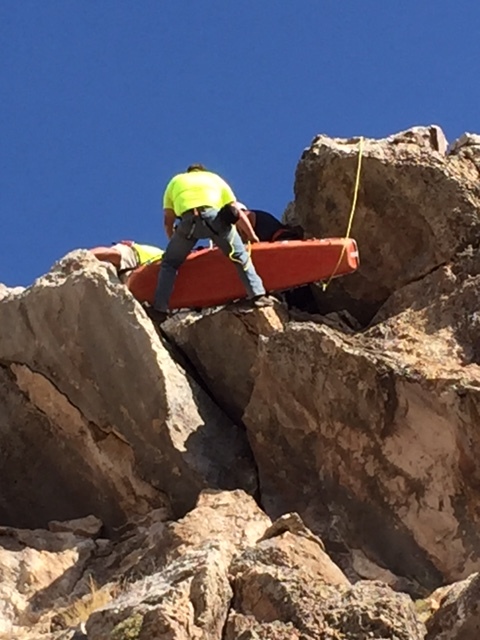 Rescuers placed her in a stokes basket with Search and Rescue volunteer Jonathan Hummel serving as tender, accompanying her up the face of the rock. Thomas and others helped with the raise from the bottom. Life Flight and Bureau of Land Management personnel assisted from the top. “The pilot, the nurse and the paramedic came over and got on the lines, the ropes, and helped pull the lady in the stokes basket with the tender Jonathan Hummel up that 100-foot raise,” Cashin said. Life Flight then transported the woman to Dixie Regional Medical Center in St. George where, Cashin said, she was scheduled to have surgery to repair her ankle, likely sometime that night. The entire rescue operation from the initial call to completion took over seven hours. It went off beautiful, Cashin said, in a very difficult location due to the united effort of so many people. Yes this did end well and everyone will be going home to their loved ones. a perfect example of people working together for a common cause. Job well done everyone ! Hip Hip Hooray ! Praise the Lord ! You are trying way too hard. Take some more pills. Accidents are quite common in this rugged yet wonderful area we live. Thanks to incredible emergency personnel, and compassionate residents and visitors, many stories have such a happy ending. Thanks to everyone who makes this a great place to live! Jimmym..yes this is a great place to live and we are blessed to have such wonderful people that serve and protect the public and our community have a wonderful day.